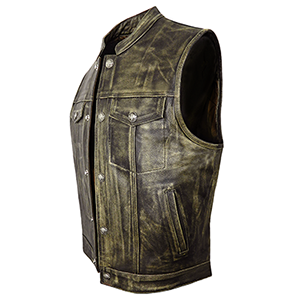 Need a leather cut off to wear over your jacket? 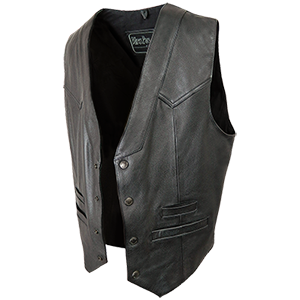 Want a leather waistcoat that lends itself to having patches all over it? Want style AND practicality? We’re sure you’ll find what you’re looking for, here. 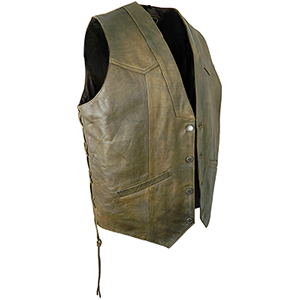 This antique brown sheepskin waistcoat is perfect for chilly days. The tough leather cut made for patches. Elite by name, elite by nature. 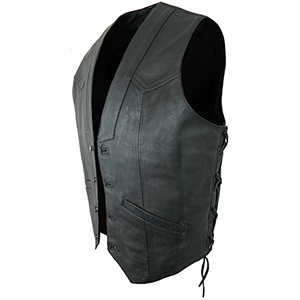 This matt black leather waistcoat is superior to most. 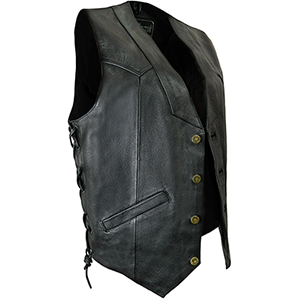 Superior plain waistcoat/vest. 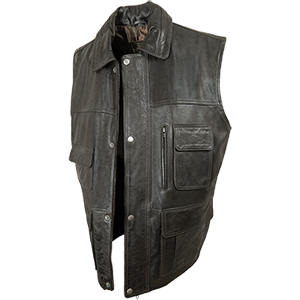 Made in high quality black cowhide. Heavy duty 100% cotton lined, with strong cotton pocket linings. Inside pocket. Button fastenings to front. 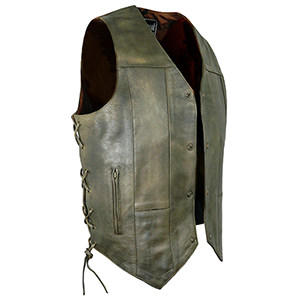 A superior plain, distressed antique brown, waistcoat. 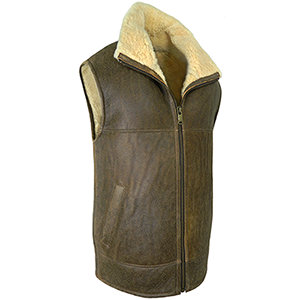 Made in high quality antique brown cowhide. Heavy duty 100% cotton lined with strong pocket linings. Inside pocket. Button fastenings to front. 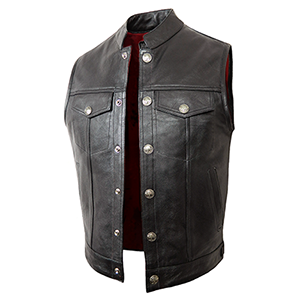 Made in high quality standard cowhide. Heavy duty 100% cotton lined with strong cotton pocket linings. Inside pocket. Open, adjustable tie-sides. 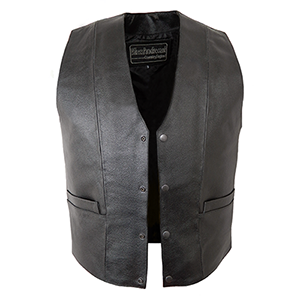 The latest addition to our Elite leather vest range. A supremely stylish tie side leather cut made in really smart matt black cowhide and tailored to fit with flattering lines. 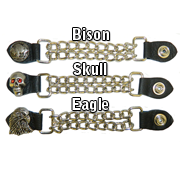 Made in the finest quality cowhide leather. 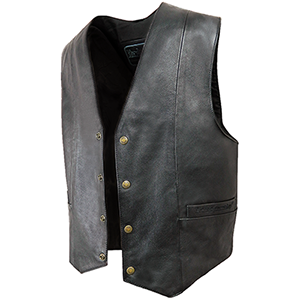 Made with slightly larger arm holes to be perfect for fitting over a leather jacket. 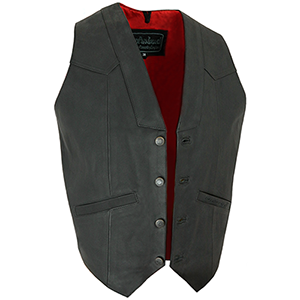 Simply styled waistcoat/vest. 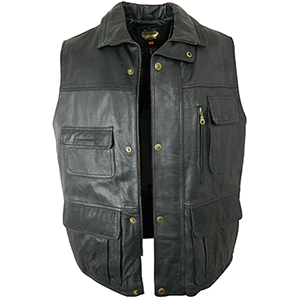 Made in high quality, black cowhide. Heavy duty 100% cotton lined, with strong cotton pocket linings. Gunmetal popper fastenings to front. 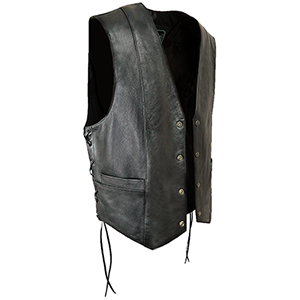 Simply styled waistcoat/vest with open adjustable tie-sides. 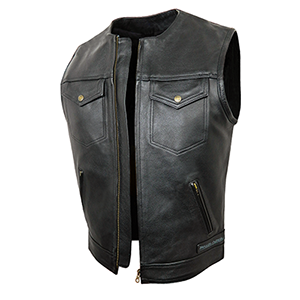 Made in high quality, black cowhide. Heavy duty 100% cotton lined, with strong cotton pocket linings. 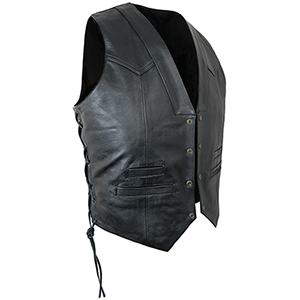 Very stylish waistcoat/vest with front yoke and lapel panel details. Four outer pockets. 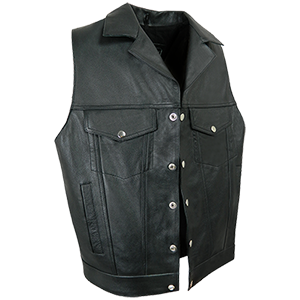 Made in high quality, black cowhide. Heavy duty 100% cotton lined. 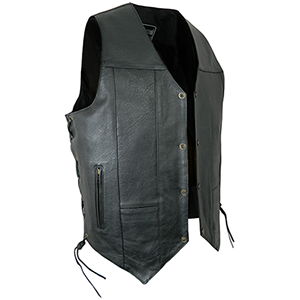 Very stylish waistcoat/vest with front yoke and lapel panel details. Four outer pockets. Open adjustable tie-sides. 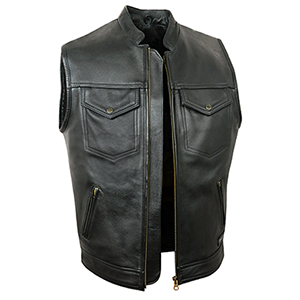 Made in high quality, black cowhide. 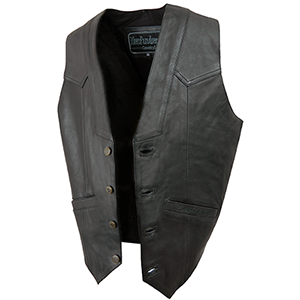 The most practical leather waistcoat we’ve ever produced. We should give a spoiler alert with the name of this quality cut, but you guessed it – it boasts 10 POCKETS! A traditional denim cut style made in supple black cowhide. 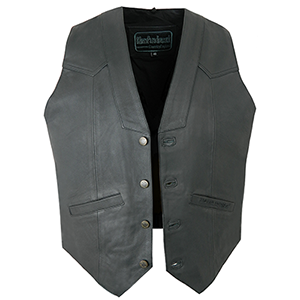 All the features of the denim waistcoat. 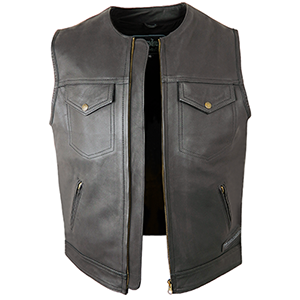 Made in high quality black cowhide. Heavy duty 100% cotton lined, with strong cotton pocket linings. 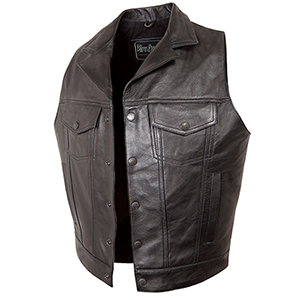 Made in heavily distressed brown cowhide, this Bison leather cut has real character. 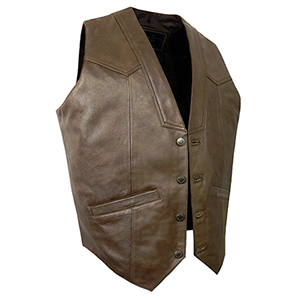 An easy-to-throw-on, comfortable and durable sleeveless jacket in soft brown leather. 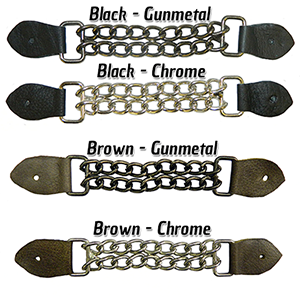 Choose from either gunmetal or chrome with black or brown leather tabs and whether you need a press stud or button hole.